Well, it was bound to happen eventually. Extremists on both sides thrust Starbucks unwillingly into an issue despite their request to be left out. Now the company has ratcheted up its request to stay out of the Second Amendment debate by asking gun owners to leave their openly carried firearms out of its stores. In an open letter penned to both sides, CEO Howard Schultz reiterated the company’s long-standing position. However, as he points out the debate has become uncivil. Open carry activists have staged Starbucks appreciation days that don’t accurately portray the company’s position. And the anti-gun crowd has disrupted business by “soliciting and confronting” customers and employees. This whole thing reminds me of when I was a child and my brothers and I would bicker near my father. Dad didn’t care about our argument. He just didn’t want to hear it. Instead of getting himself involved and trying to solve our problems, he simply told us to get away from him. 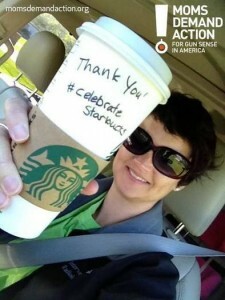 To be clear, this is not a victory for Shannon Watts and Moms Demand Action for Gun Sense in America no more than Starbucks’ stance was a victory for open carry activists. This is exactly the position Buckeyes for Concealed Carry took on the issue eighteen months ago. We utilized a gun control group’s boycott of Starbucks to call a ban on campus concealed carry to task. Our position was simply that if a private company can get it right and leave concealed carry up to legislators, why can’t our university? Campus concealed carry is not an issue a university should take a stance on. I encourage public universities to take Starbucks’ stance. Leave the campus carry debate up to legislators.